Aries: People in a romantic relationship will be very happy today as they will get to spend the evening with their beloved. Children awaiting their examination results might be disappointed today. They need not take it too hard on themselves as they would certainly excel in their next exams. Those seeking an employment opportunity might meet someone influential today. They need to ensure that they make a good impression. Lawyers might have to give their opinions and deal directly in some important legal affairs that they are dealing. Students would have to deal with distractions and difficulties today. Their lethargy too would delay projects. Teachers must show the maturity to be able to take in any feedback that comes regarding their work in a sensible fashion. Taurus: Those who are married would today spend an evening out with their partner and kids. An enjoyable evening on the whole. Children going out for boating or trekking need to be very careful. Adults accompanying them should take all caution as minor accidents are predicted. Those who are unemployed may meet new people today. They might be of great help for them in procuring employment. Those who are in the legal field will be very enthusiastic and will be very successful today. Teachers should keep an open mind today. They might require to be a little tactful to deal with unusual requests from students. They would surely be able to win over the students. Artists will gain satisfaction by doing something creative like painting or writing. Gemini: Those who are single might meet their true love today. A travel is predicted for today. This journey would be to complete a matter that has been pending for some time now. Those who are venturing into the real estate business today will find encouragement. Those in involved in trading in the share markets would today stay away from work to enjoy the day with their family. Politicians would today be noticed by people who matter and are influential. This would be very beneficial for their career. Financial problems that might crop up during the first half of the day would get sorted in the latter half today. Cancer: Those in love must now let go of their past and open up to allow the future in. holding on to the past will only close them to the happiness that might come to them. Those who are single must now start thinking of their own welfare. They should now take off some of the extra responsibilities that they have been carrying upon them. Family functions or get-togethers today will make the elders in the family very happy. They would be glad to meet all their sons, daughters and other relatives. Students would today spend their time seriously preparing for their exams. They would not waste any time as they plan their schedule very efficiently. Sportspersons may expect to be rewarded for their achievements in their respective field. They might receive a lifetime achievement award. You will be powerhouse of energy today. You will feel very healthy too. Leo: You will empathise with people close to you and understand the troubles they are going through. You will provide them with solace. Parents or relatives might bring suitable marriage proposals for those who are eligible for marriage. A long trip is predicted for you. The journey would take you away from your family for some time. Those in the field of technology may have to face a disturbing day at work today. Sometimes their materialism may even be taken for arrogance. Accountants need to be very careful today while handling important files. There are chances of committing errors if not cautious. Students might today have a dull day as they begin to feel as if their logical abilities have slowed down. They have been taking too much stress and need to relax a bit. Virgo: Your generous and warm qualities would bring you some joyful and loving moments. Children will show affection and care for their younger siblings today. Those who are unemployed would be rewarded for their hard work and determination. Those in the legal profession will work towards establishing their business and career. They would take the steps towards this goal today. Colleagues and department heads would be pleased with teachers today for the effort they have put in. A promotion might also be on the cards. Those in the show business may make new friends today. These new relationships would help them in their career. Libra: A holiday or a journey with your beloved is predicted today. Children staying away from the family for studies, etc., may visit unexpectedly. Their visit will bring joy and celebration in the family. There may be some uncertainty today in the financial status of businessmen. This might trouble them a lot. Real estate brokers would do well today to postpone official meetings as they may be pulled up for misrepresenting facts. Sportspersons will be very active today. They would feel very energetic and up to a challenge or adventure. 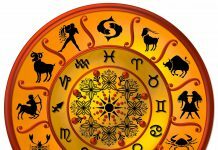 Scorpio: Those who are single might be overburdened with work today making them very short tempered. They are advised to be patient while dealing with their officers. A very good day to send out resumes if you are seriously looking out for a job. As someone might recognise your potential. Students who are not too interested in the academics might win rewards in extra curricular activities. A good day for those who like exposure and publicity. Movie artists, or people in the fashion industry would especially find it gratifying today. It might be advisable to postpone investing in any new scheme today. Not a favorable day for you to begin a new financial deal. Sagittarius: Those who are single might receive marriage proposals from unexpected sources. Share market investors and brokers are advised to avoid gambling or speculating. Especially if they are dealing with other people’s capital. Politicians with an enterprising spirit may rise to prominence today. They would be able to advance their career and attain a higher position in their party. Sportspersons might meet with someone today who would guide them properly in their respective sport. Your physical health depends on your mental health. Since you will be very happy today you will feel healthy and physically fit as well. Capricorn: Lovers may look forward to spending a good time together. Those who are seeking a new job might get an offer for a new job. This will also bring them fame and recognition. Those who are technically qualified will today arrange some important meetings. These could affect their career immensely. Advocates can expect new cases coming their way today. These cases would bring reputation and money for them. A good day for students today who are interested in extra curricular activities like debate, elocution, etc. Auspicious functions may keep those in the movie and literary industry very busy. Aquarius: Holding on to your emotions and feelings and not sharing with your partner is not good for you. It would also make your partner feel alienated from you and might be a cause of worry for both of you. The elderly in the family may want to visit relatives today. Taking them out for the short visits will make them really glad. You might meet someone unforgettable during your travels today. Those seeking a job for some time now might not be rewarded for all the efforts they have been putting in. Share brokers and gamblers could be very lucky today. They might win everything they touch. Pisces: Parents of those who are single might not allow them to go out of party today. Children will today excel in their exams. They will pass out with flying colors. Parents will be very proud of their achievements. Medical professionals may be tired today. But they won’t be able to take any rest as the work pressure would be too much. A good day for those students who are pursuing accounting, management and allied studies. Artists, composers, directors and other creative people would be inspired to create something beautiful today.